Prior to the return of the Monarchs in 1960 under Ian Hoskins, there were two earlier meetings held - on 18th April 1959 and 23rd April 1960. These were part of the Edinburgh University Charities Appeal and were organised by the EU Engineering Society, the prime mover being Ian Hart. Ian had remarkably persuaded the Edinburgh council to allow him to practise Speedway from 1957, and he went on to be a regular second halfer and occasional team man. The 1959 event featured guest star Ronnie Moore, who won the World Championship for the second time later that summer. In 1960 another Wimbledon rider Ron How was the star attraction. This meeting was staged on a day when Monarchs rode away at Stoke! 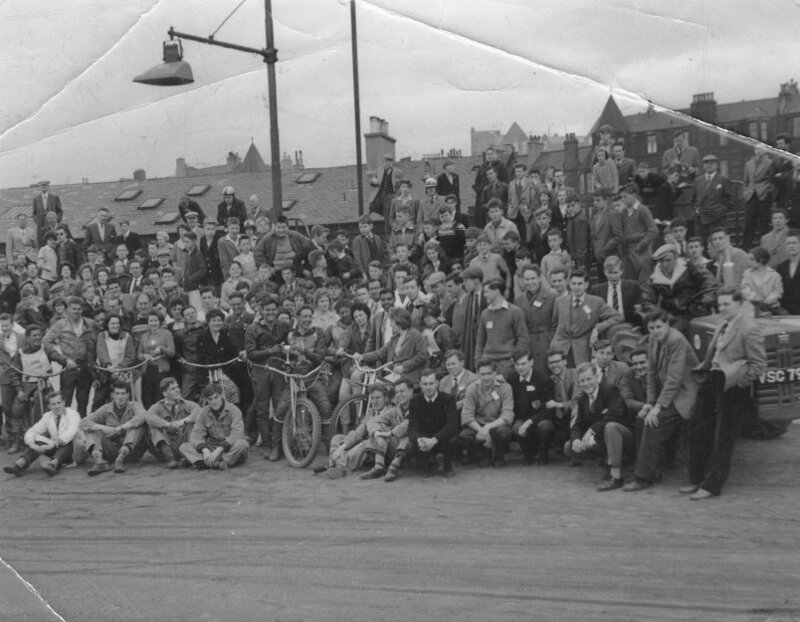 The photo is from the 1960 event with How in the centre of the photo.